The Catholics and Public Life Conference is a joint initiative of the Catholic Association of Propagandists and the San Pablo CEU Foundation. The Catholics and Public Life Conference has been organised since 1999. Its aim is to provide a forum for people to meet and reflect on how to adapt society to humankind and all its dimensions. The purpose of these meetings is to act as a point of reference and meeting for Catholics and also to promote participation in the public forum, so that faith is not relegated to the private sphere only. Each year respected experts and professionals from politics, economics and the social environment come together to explore current affairs from the perspective of faith and Christian values. 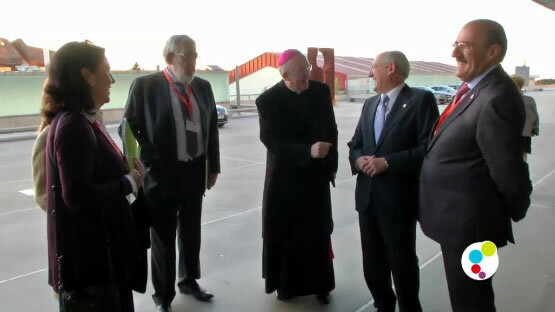 The Conference runs each year alongside the Youth Conference which is aimed at children and adolescents and organises regional Catholics and Public Life Seminars. Your browser don't support this video. Office 2.5.3 - EPS. Universidad CEU San Pablo - Campus Montepríncipe, 28925 Alcorcón (Madrid), España.